Sponsorships have always been an important revenue source for all sports properties. They are also one of the fastest growing revenue segments in sport, with a growth rate of 4.8% and climbing. The sponsorship landscape is undergoing many changes, the most important of them being the shift to performance or incentive-based sponsorships. A performance based sponsorship is built on incentives for performances by athletes, teams and leagues both on and off -field. For example in this type of sponsorship model, an appearance by a team/athlete in the playoffs (on-field), or a digital/social promotion that engages fans and leads to increased brand awareness (off-field) will lead to additional incentives from the sponsor. Performance-based sponsorships in the context of this article refers to incentives provided by the sponsor to its sponsoring properties based on their off-field or digital performance in promoting that brand. Among these, media rights and sponsorships have been the two biggest revenue sources for sports properties. With change in media consumption among younger fans, media & broadcasting has been undergoing a major upheaval. Until now, fixed fees and multiyear deals were the norm in sponsorships. Brands sponsored the properties they were passionate about, and believed would provide them with more brand exposure without any real metrics to verify that increased exposure. In turn, sports properties promoted their sponsors through logo and name placement on their uniforms and event site, and advertising through billboards, TV spots and newspapers. Sponsorship ROI was then measured based on assumptive metrics such as TV viewership and event attendance, leading to larger and more successful (on-field) athletes, leagues and teams gaining more sponsorship deals and money compared to their less successful counterparts. Social and digital media have dramatically affected the traditional sponsorship model. Before social and digital media became widely prevalent, the traditional method of promoting sponsors worked due to two major factors: the media was limited, and fans could catch their favorite sport broadcast only at particular times and channels. This gave sports properties the ability to control their narrative and push the content that they needed, at a time when they were sure their fans were tuning in. After social & digital media’s entry into the mainstream, media is no longer limited. Sports can now be consumed at any place and time and fans are easily accessible and reachable 24/7. Lesser known sports and sports properties are using social media more efficiently than some of their mainstream counterparts, and creating meaningful and effective interactions with their fans. This has presented sponsor brands with multiple opportunities and newer avenues to segment and engage their intended audiences. How has this affected sponsorships? Sponsor brands have started to take note of this shift in consumer and fan behavior. Brands can promote their own products and services on social media, but consumers are more receptive and positive to brands endorsed by their favorite athlete, team or league. Athletes, teams and leagues now have complete control of their personal brand and how they communicate with their fan bases, whereas in the past, this was largely controlled by the traditional media properties. Now, more than ever before, the opportunity for brands to get their message in front of new audiences through cross promotions with sponsored entities on social media, has made the need to measure the effectiveness of sponsorship and the money being spent on it extremely important. In order to keep up with changes in consumer behavior, deals between sponsor brands and sports properties have now begun to evolve, with new metrics and KPIs being incorporated to address their new objectives. Sponsor brands set certain objectives that sports properties need to meet, such as certain levels of engagement on social media or increased brand awareness within that market. The properties are then paid or provided with incentives when they reach the goals set by the sponsor. Goals are set based on discussions between the sponsor and properties and this ensures that properties understand the goals and expectations of the sponsor and vice-versa. These performance-based sponsorships help sponsor brands understand which sponsorships result in maximum ROI and help them stay relevant and connected with the consumer. The first sponsor to publicly introduce this performance-based sponsorship model was AB InBev, who spends more than $350M on sponsorships, according to the report by ESP Properties. 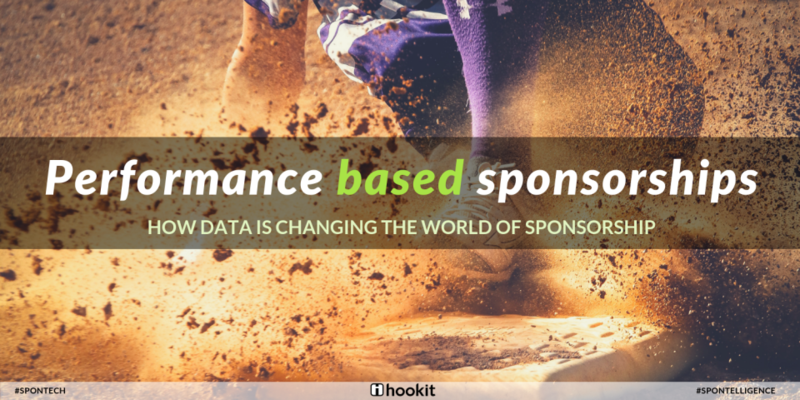 With more and more brands understanding the need of performance-based sponsorships, it becomes important to identify the right tools necessary to accurately measure and value the ROI of their sponsorship investments. A pioneer in the spontech movement, Hookit has developed the first, most trusted platform to effectively measure the impact of brand sponsorships in real-time on social & digital media in a balanced and unbiased way. The ability to measure in real-time against a consistent set of KPIs will be paramount for brands to successfully make the leap to a performance-based model in order to optimize and maximize their sponsorship and activation investments in sync with their partners. Learn more about what Hookit can do for you! Coming next week, the metrics and KPIs brands need, to measure the effectiveness and value generated from their sponsored properties through social media!